If you want to make some spark or add some bright effects to a photo – use appropriate decorative accessories. Nowadays it’s not a problem and you can use various additional things related to different fields of art to enhance the quality of your photo and make it really bright and outstanding. Food photography is an obligatory element for any company that deals with beverages and food. The main reason why marketing and advertising companies use food products in their campaign today – is that the restaurants that utilize photos in their menus sell more dishes than those who use only its titles and written descriptions. To make an excellent shot is not so easy as it seems, food photography is considered to be one of the most difficult specialities for photographers. Sometimes, an artist has really less time to make two or three pictures before the food is no longer at its best shape. Nowadays, photographers can achieve great results that would have been impossible decades ago. They get off such amazing shots that viewers find them more than particularly tempting. To ensure your photos of food and beverage are effective and enticing, follow these simple but really wholesome tips and tricks for food photgraphy. Fake ice cubes comes in different shapes, sizes and various materials, the most popular are acrylic and plastic. Acrylic ice cubes are, as you understand, not real and can be used only for merchandising or photography purposes. Of course they can not be frozen or used for chilling, but they make beautiful items of display, provide a glitter to the decor and you can utilize them as aesthetics props when taking photos. Plastic Ice Cubes are also good helpers in the process of photography. They have some kind of non-toxic gel inside, you can freeze them and pop into drinks and they won’t sink to the bottom of any liquid. These cubes come in various funny forms, such as balls, animals, fruits, hearts, cherries and shells. A great advantage is that plastic cubes can be re-used: just wash them and these ice cubes are ready. Fake ice cubes are highly demanded in photography and even in film production, because real ice melts quickly and is difficult to work with. Some production companies sell fake ice cubes, like Trengove, a special effects store in New York. They are not cheap, often costing up to 30$ for a single cube. Fake ice is very handy to use and it doesn’t melt under the hot photography lights, so by using it you can really simplify your work. Drink with lemon and refreshing ice cubes. The composition looks so seductive that it’s hard to resist the temptation to empty this glass. Two ice cubes in the glass. The picture creates an impression as if ice is melting and transforming into water. What is it and why do photographers use it? It is a neutral, sweet-tasting, colorless, thick liquid which freezes to a gummy paste and which has a high boiling point. Glycerin can be dissolved into water and alcohol. Many things will dissolve into glycerin easier than they do in alcohol or water. So it is a good solvent. This thick liquid has a variety of uses, it can be used in prints and inks, lotions, preserved fruits and it can be used as a lubricant, due to its antiseptic qualities glycerin is applied in scientific specimens. It can be also used to make a dynamite, but of course it is not explosive on its own, so don’t be afraid to hold a glycerin soap. Photographers also like to decorate their photos with beautiful details and to make these details more outstanding, prominent and natural they utilize glycerin. In the pictures we’ve showcased below you can see the examples of their work. A bottle of wine with two glasses which look like they have been already filled in. The artist achieved such effect using glycerin and water spray for a lasting and controlled condensation look. These fresh palatable drops will stay on for about 15 minutes. 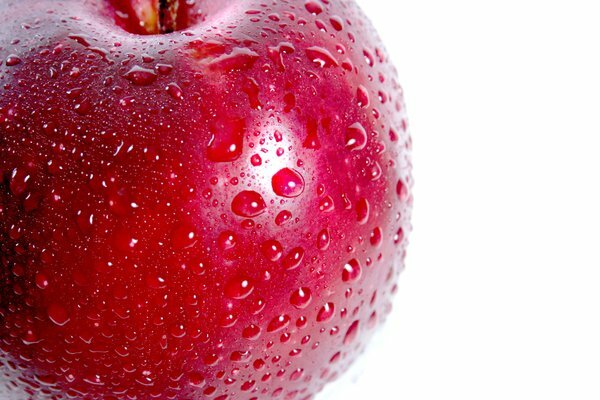 In order to make this apple seductive and appetizing the photograph also have applied a water-glycerin mixture. It gives a fruit a juicy, glistering and so tempting appearance. Photographers use glue instead of real milk for cereal photos, for hot chocolate photos and for pie repair shots. It’s a good way to make the food as appetizing as possible. White multi-purpose glue prevents flakes from becoming soggy too quickly and the bowl with glue won’t slosh around during the photography process and won’t become discolored after a long period under bright hot lights. If the artist delicate spread more glue among the flakes they will look really natural and mouth-watering on the photo. Of course it isn’t milk, it’s glue with variegated round corn flakes. They can’t be eaten, but look really cute and appetizing. This composition was made using clamp to hold the spoon firmly in the place and placing glue on the spoon. Then the creator of this artwork with the help of tweezers added flakes and more glue between the greased flakes with toothpick. The last step – the artist added natural oiled strawberries. Oh, I want to eat it right now. This beautiful cup is filled with genuine chocolate glue. The author of this shot has used chocolate bars. He melted them and stuck in a cup then mixed with glue and the result is in front of your eyes. A palatable hot chocolate without messing with powder and milk. The only shortcoming is that this beverage can not be drunk. Would you like a cup of tempting hot chocolate? Rebecca Smith works for flashtemplates.com, a top-class leader on the market of flash gallery templates, flipbook flash templates and flash CMS templates. Rebecca writes about the Web, its up-to-date approaches and state-of-the-art flash technologies. Outside of her job, she has a passion for art, literature, and the outdoors.